CD22 blockade restores homeostatic microglial phagocytosis in ageing brains.Pluvinage JV, Haney MS, Smith BAH, Sun J, Iram T, Bonanno L, Li L, Lee DP, Morgens DW, Yang AC, Shuken SR, Gate D, Scott M, Khatri P, Luo J, Bertozzi CR, Bassik MC, Wyss-Coray T. Nature. 2019 Apr 3. doi: 10.1038/s41586-019-1088-4. [Epub ahead of print. Microglia maintain homeostasis in the central nervous system through phagocytic clearance of protein aggregates and cellular debris. This function deteriorates during ageing and neurodegenerative disease, concomitant with cognitive decline. However, the mechanisms of impaired microglial homeostatic function and the cognitive effects of restoring this function remain unknown. 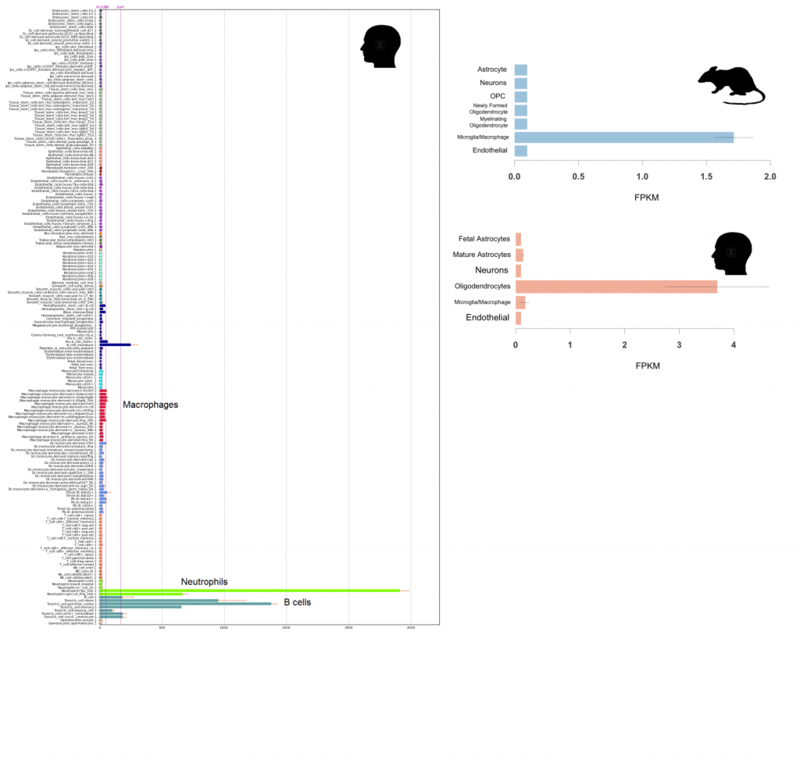 We combined CRISPR-Cas9 knockout screens with RNA sequencing analysis to discover age-related genetic modifiers of microglial phagocytosis. These screens identified CD22, a B cell receptor, as a negative regulator of phagocytosis that is upregulated on aged microglia. Inhibition of CD22 promotes the clearance of myelin debris, amyloid-β oligomers and α-synuclein fibrils in vivo. Long-term central nervous system delivery of an antibody that blocks CD22 function reprograms microglia towards a homeostatic transcriptional state and improves cognitive function in aged mice. These findings elucidate a mechanism of age-related microglial impairment and a strategy to restore homeostasis in the ageing brain. To get repair you have to remove the debris from the demyelination damage. This requires the action of phagocytosis, but as they age they become less able to do this. So here we find a switch factor that rejuvenates the microglia so they can promote repair. In this study they did a search of thousands of targets to get CD22. This is one of a few that I have seen recently. Here they inject a CD22 blocker into CNS and get enhanced removal from microglia. Trial here we come you say. However there could be trouble ahead. (a) Antibodies are not the solution to treat brain diseases as antibodies simply do get into the brain very well. Pharma keep throwing away good targets by ploughing on with things that are 99.9% excluded. (c) CD22 is expressed by B cells and other immune cells . Blocking their function could have unwanted effects. CD22 is a molecule found on the surface of mature B cells and to a lesser extent on some immature B cells. Generally speaking, CD22 is a regulatory molecule that prevents the overactivation of the immune system and the development of autoimmune diseases. Therefore, one has to have a concern about the value of block this target to promote remyelination. Epratuzumab, a humanized anti-CD22 antibody, is currently in clinical trials of B-cell lymphomas and autoimmune diseases, demonstrating therapeutic activity in non-Hodgkin lymphoma (NHL) and systemic lupus erythematosus (SLE). One thing it does is that it causes other antigens to be shed and picked up by macrophages so B cells treated donate CD22 to macrophages. Mouse Dr is addicted to B cells . “Although Palmer rejected most of the excesses of the rock ‘n’ roll lifestyle, he was a heavy tobacco user who smoked as many as 60 cigarettes a day. He is pictured on the cover of his latest release with a cigarette in one hand.